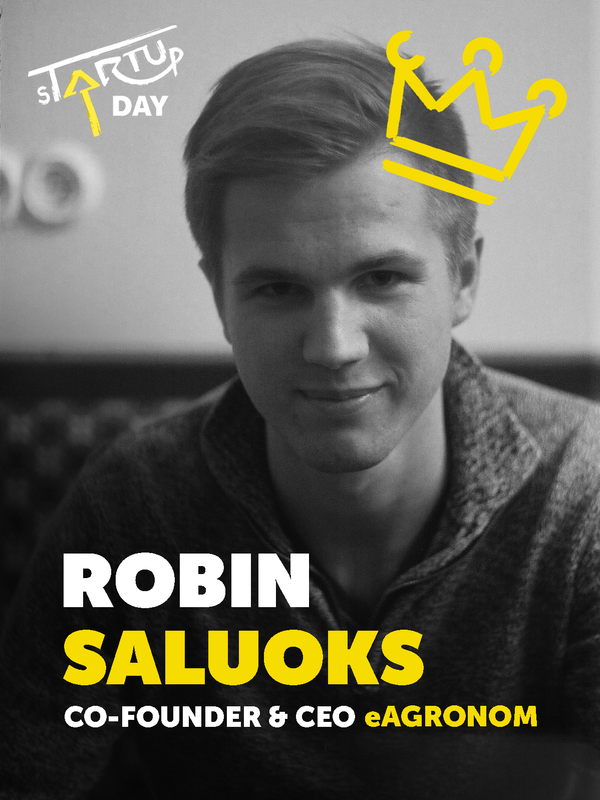 Robin Saluoks - co-Founder and CEO of eAgronom, Hero of the week. And yesterday the title of the Young Entrepreneur of the Year was added to the list at a festive gala organized by The Estonian Chamber of Commerce and Industry and Swedbank. eAgronom is one of the fastest growing startups in Estonia. Their success story is amazing – a couple of months ago they have raised 500K through a crowdfunding campaign from over 50 different investors to develop a software platform for farmers. eAgronom is used in five different countries and on over 700K hectares.eAgronom is one of the world's top 5 biggest companies in its field. Great assumptions have been created that by the end of this year they will occupy 2% of the European Union's total cereal area. “eAgronom is a revolution where smart people gather together to change the world by helping farmers. We build software that saves farmers’ time and guides them in making better decisions. We believe that helping farmers in achieving their long-term financial goals will result in reduced CO2 level, a cleaner environment, and healthier food,” Robin explains the mission of eAgronom. How did you start with eAgronom? Was it rather easy or difficult? What were the main obstacles? My father is a farmer and at first, we built a tool to solve his everyday challenges. Other farmers noticed his new solution soon and this sparked our eye. We saw how many hours farmers are working and how stressful the job is. At the same time, farming is one of the biggest environment polluters. This doesn’t need to be so and people in eAgronom know it. This knowledge helps us to overcome all challenges since we know what will happen if we don’t. Why is now the time for eAgronom to exist? There are three main aspects thrive our existence right now - generation change is happening in farming very fast, prices of farming inputs have been rising heavily and climate change is affecting farmers. Our average user is 50 years old, but most of the farms the younger generation has become more active. In many times, they are the ones who push the decision toward IT tools instead of staying with pen and paper. Prices of farming inputs have been rising heavily, but income from grain stays the same. This has pushed farmers to think about how to use fewer chemicals and still get the same results. This is where eAgronom software comes handy. Environmental change is affecting farmers and they feel it. I was just recently on the tour to meet our Polish farmers. All of them said that the weather has been more extreme than 10 years before. They lost more than half of their harvest because of the heat wave this year and same happened because of too heavy rain year before. This has turned many of them thinking - how to farm without disturbing the environment? Luckily – chemicals, fertilizers, and soil killing cultivation technics are one of the biggest costs for farmers. They are happy to reduce these activities and give less money to big chemical corporations. What has helped you to get where you are now? Farmers who use eAgronom can feed more than 3 million people endlessly. This means that in real food that they produce gets to tens of millions of people. We have reached this by following three simple guidelines - Farmer first; Set goals. Ship it. Iterate; Be transparent. Everybody in our company visits farms. We ride tractors, harvesters, talk with farmers and learn from farmers. eAgronom is built by top agronomists, consultants, farmers, engineers, researchers, and public figures. Farmers have even invested in us. Instead of trying to achieve perfection on the first go, we ship stuff fast. Only once something is out in the real world we can collect feedback and learn from it. Improving on feedback is what achieves perfection the fastest way possible. Transparency empowers people and removes fiction. We want bad news to spread fast and be brutally honest about it. For example – If the client is not our target customer, we tell them that we might not be the best software for them. What is the most challenging thing of being the leader? eAgronom has smart people who are very motivated to help farmers. Challenge and beauty of building a business are that there are always more opportunities than recourses. Deciding what to focus on, what to delegate and what to ignore is most important for the leader. Every day I get inspired by the people who I work with. Many of them have built products for millions of people before and working with them gives new lessons every day. I am honored to have this chance to work on these major global problems like climate warming, the destruction of soil and environment pollution. I am happy that I can do it via helping people who provide us food – farmers. The Award of The Young Entrepreneur of The Week is funded by Swedbank Eesti AS.